NPHS class of 2018 graduate Nina Raman poses for a picture with her friend Kassandra. North Penn class of 2018 graduate Nina Raman has taken on new leadership roles at Temple University. 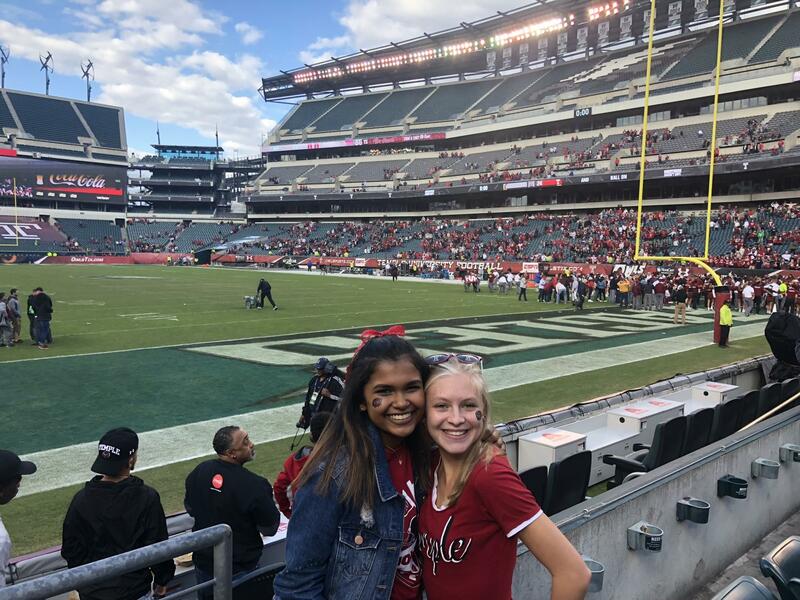 Although Raman initially applied to Temple as a communication studies major, she switched her major to business management when her parents encouraged her to try it out. “I really fought the idea of going into business for a while because I thought I wouldn’t be able to exercise my creative side, but my parents told me to try it and see if I like what I learn. So I switched my major from communications studies to business management,” said Raman. Since then, Raman has discovered a love for business and the leadership opportunities it brings. “What I didn’t realize was that being a business student would open so many doors for me. Being a leader in business is something entirely different. To be a leader, you need to be someone people can talk to from all sorts of levels and someone people can relate to. Because there are so many areas of business, business leaders need to be that much better, so I learned to accept the challenge,” Raman explained. Raman is continuing to be actively involved in college similar to how she was in high school. At North Penn, she was in Thespian Troupe as a fundraising coordinator, the Knight Crier as both a staff writer and an editor, Women’s Choir, and Chamber Singers. Now that she’s at Temple, she’s a part of Fox Professional Speakers which is Temple’s own Toastmasters International club. Toastmasters is an international club recognized for grooming people into being persuasive and powerful speakers. Communications classes such as public speaking and news journalism at North Penn sparked Raman’s initial love for speaking in front of people and sharing her views. “[Toastmasters] made me feel right at home at Temple because for once something wasn’t so foreign. It really helped me throughout the year because it was the halfway point between business and communications,” expressed Raman. In addition to Toastmasters, she’s been involved in the Women’s Entrepreneurial Organization (WEO) which brings in businesswomen in the Philly area as speakers to show women in support of other women in the business field. Raman will hold an e-board position, similar to an officer, giving her the chance to exercise her leadership role on a daily basis. What’s your favorite part about college? My favorite part about college is the amount of freedom you have. Because you’re an adult, all of your decisions reflect on you and your character, and it’s up to you if you want to succeed or fail. There are so many other things you have to juggle while you’re in school: your grades, social life, finances, etc. Sometimes it’s a little overwhelming, but these are things they don’t teach you in a classroom that you have to learn on your own and grow as a person. Even though I really love college, there are a few things I really miss about North Penn. One of the things I miss is the music program. As a business student, I don’t do a lot of singing other than alone in my room playing my ukulele. I miss being part of a group and North Penn’s choir department is so big and accepting, sometimes you didn’t go for the music, but for the people. Another thing I miss at North Penn is The Knight Crier. I’m a writer at heart and being able to express my opinions and views to complete strangers justifies the importance of having a voice. I tried to join Temple News in the beginning of the year, but something didn’t feel right. It felt like an actual competitive newspaper instead of a club of people who really love to write. So instead I’ve settled for writing speeches, creative writing, and now I’m starting a blog to hopefully relate to people my age and speak candidly about the ups and downs of college and life. Advice to current high schoolers? My advice for high schoolers is to appreciate your education. A lot of times when the bell rings at 7:21 to start first period, students wish they were somewhere else, but your education is a privilege. School teaches you the foundations of everything, and you’d be surprised with how much information you retain from your education.